You know those times when you just want a home cooked meal but just don’t feel like cooking? The Parkway Deli is my place for those days. 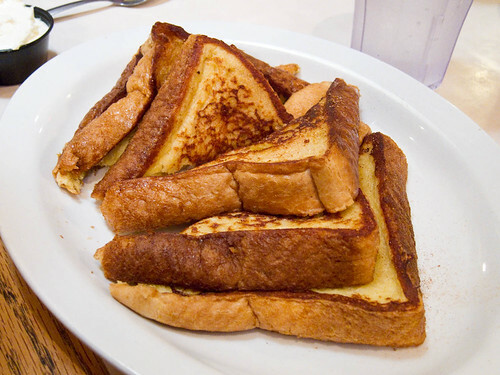 Located in Silver Spring, MD, just off of East West Highway, “The Deli” is a no fuss Jewish restaurant combing the best of a new York deli and greasy spoon diner. It’s sandwiched in a strip mall in between a fitness center and organic co op, a rather unassuming place. Upon entering The Deli you are greeted by an extensive selection of wine and beer, available for eat in but most likely for takeout. Walking past the liquor toward the dining room, you there is a long case of cakes and pastries and the takeout counter. Assuming you’ve made it this far and there still no line you’re doing good. On weekend mornings, the line can be back to the front door. But it moves fairly quickly and it’s worth the wait. It’s a good place to go with a group of friends or family, so they’ll entertain you while you wait. You’ll be seated by the host, maybe after he shuffles around some tables, and join the boisterous ding room of the deli, filled with young and old from every walk of life. It’s a neighborhood place. The menu is large, with breakfast, lunch, and dinner available all day. 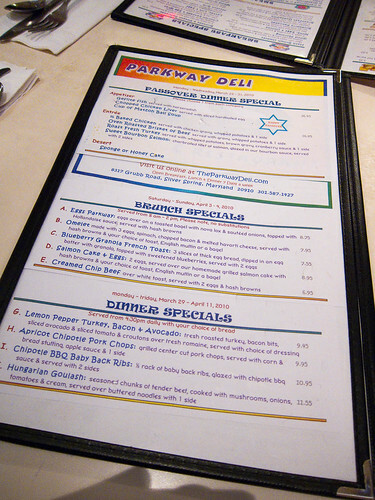 The Deli has the expected diner and deli fare – from omelets to pancakes to sandwiches to turkey and gravy to Sundays. 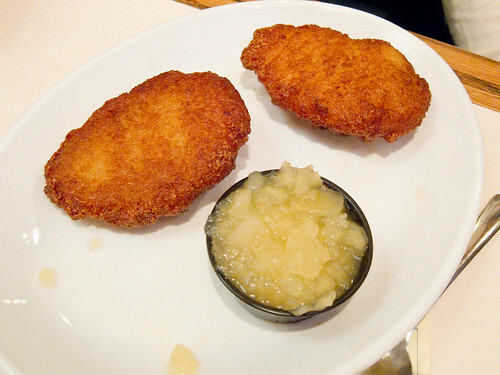 But The Deli also has it’s Jewish dishes – matzah ball soup, corned beef, pastrami, knishes, lox, gravlax, pickles, blintzes, and potato pancakes. And it’s all d’lish. In fact, during lunch and dinner, The Deli has a free pickle bar, with as a dozen or so types of pickles, relishes, and other picked items. I always load up while I wait for my meal. 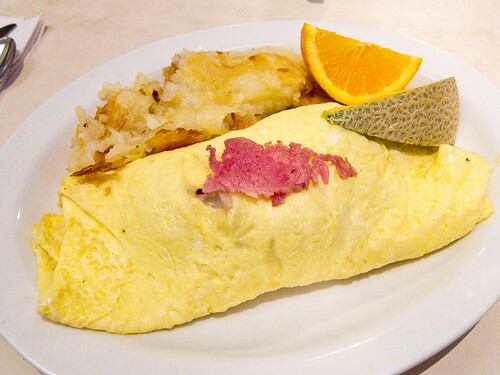 During out most recent visit for Saturday breakfast, I ordered a corned beef and Swiss omelet. which came with toast, hash browns, and fresh fruit – a slice of cantaloupe and orange. It’s nice to have the refreshing fruit after all the indulgent goodness. For dinner or lunch, my staples are either the “meal in itself”, a sandwich with a mountain of warm corned beef with homemade coleslaw on rye bread. I get a side of chips, so I guess it’s not entirely by itself. My other staples is the “deli twins” a pair of corned beef and pastrami sandwiches served on fresh brioches rolls with a side of coleslaw or potato salad. Oh so good. So if you’ve never been to The Deli, get yourself there. You’ll be a convert. damn. i was hoping that my little face popping out above my menu might make it in. alas, i love the deli just the same. i’ve promised to take kayla for breakfast the first morning i live in my new place. :) and i’m buying bagels.